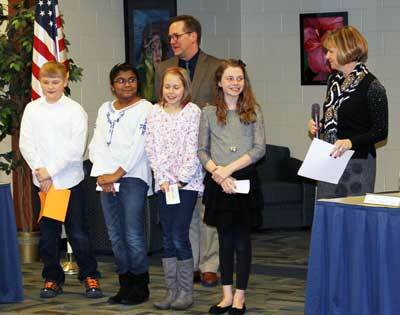 March 17, 2014 - Hamilton School District. Three Marcy Elementary School staff members and four students presented to Hamilton School Board members about their school’s student video announcement program. Fifth grade students work with library-media specialist Wendy Horsens to create brief school announcements that tell students about weather conditions, school lunch menu options, Marcy teachers and items from lost and found. Principal Michele Trawicki explained that the popular feature was created six years ago and has grown as Marcy’s Parent-Teacher Organization has contributed technical equipment for the recording studio. Music teacher Rod Loren, Ph.D., helped configure the system with Horsens and incorporates videos featuring students into school musicals. Five Hamilton High School art students who earned awards in the 2014 Scholastic Art Awards were recognized for their success in the statewide contest. Hamilton art teacher Ellen Acuff spoke to the board about the excitement for students and herself when they get the results. 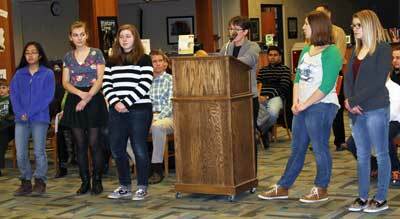 Students who earned awards and were recognized at the School Board meeting were: Laura Eichsteadt, Gold Key for senior photography portfolio; Rebecca Hang, Gold Key for painting; Rachel Klibowitz, Silver Key for printmaking; Emily Bader, Honorable Mention for drawing; and Chloe Simchick, Honorable Mention for drawing. School Board members approved purchase of $210,555 of desktop and laptop computer purchases to maintain the district’s five-year replacement cycle. The approval will fund purchase of 242 desktop and 35 laptop computers. In addition, the purchase will include storage upgrades and a web content filter. The cost to participate half-day kindergarten and middle and high school sports will increase $5 and $6. High school fees per sport increase from $45 to $50. With School Board action, the district will continue to participate in several long-standing programs including North Central Association (NCA) accreditation, Cooperative Education Service Agency #1 alternative schools and Youth Options program. Templeton Middle School and Hamilton High School will continue to participate in the NCA accreditation process that aligns planning efforts with site planning. The cost will be $725 per school. Hamilton has been NCA accredited since 1966 and Templeton since 1997. The district plans to continue using alternative placement programs including New Pathways, Turning Point, Project Success, Fresh Start and Distinguished Scholars Academy. A total of 21 high school students requested admission to the Youth Options Program that will allow them potentially to take classes next fall at Waukesha County Technical College, the University of Wisconsin (UW) –Waukesha, UW- Milwaukee, Marquette University, Wisconsin Lutheran College, Alverno College and Carroll University. Many of the requests are for a third level of calculus class which the district may offer with the Elmbrook School District. Youth Options is a program mandated by the state that allows students who have completed 10th grade, are in good academic standing and have no disciplinary problems to attend a technical college or university if they have exhausted their high school curriculum. Often, students who have been approved for Youth Options are not able to take the courses because of scheduling conflicts or full classes. In personnel matters, the School Board appointed Ashley Katz as a part-time special services paraprofessional at the high school.